Australia has been claimed for the British empire. 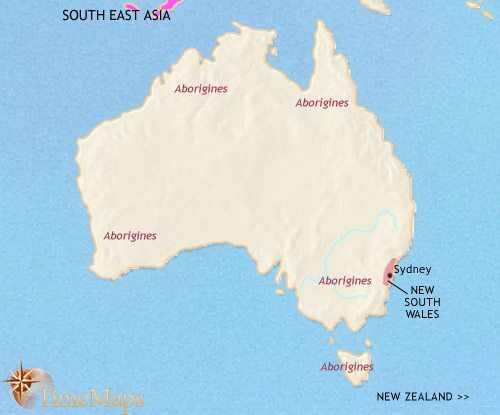 By this period, around 750,000 Aborigines live in Australia. The areas of British settlement have expanded. 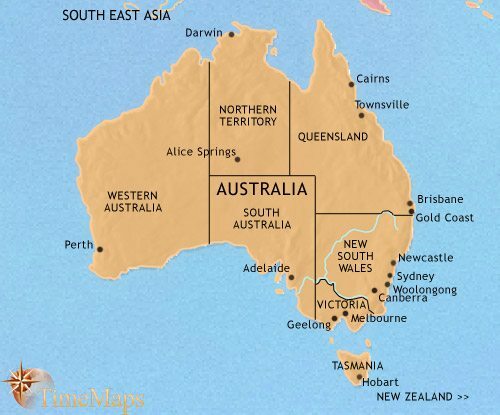 Australia now contains several British colonies. The Australian colonies have united to form one country, within the British empire. Australia is now a fully independent country. Australia has oriented itself away from Britain and towards the USA and the Far East. The British seaman, Captain James Cook, surveyed the coast of New Zealand and the east coast of Australia in 1769-70, and claimed the lands for Britain. The first European settlement in Australia has been established at Port Jackson, Sydney Harbour, in 1788, by several hundred convicts and seamen under the control of a governor, plus a detachment of soldiers. 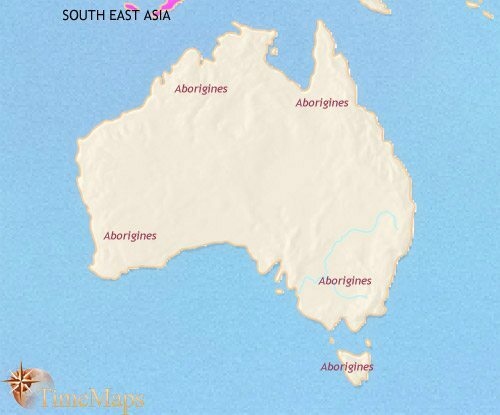 By this period, probably at least 750,000 Aborigines live in Australia. They are divided amongst some 500 tribal territories. In those parts of the continent with the densest populations, permanent villages have appeared. The inhabitants are hunter-gatherers, but use a wide range of technologies to optimise their exploitation of the natural environment. They construct fish traps, replant squashes and tubers nearer their settlements, and use fire to burn old vegetation and encourage new growth for richer plant cover. Sydney has developed slowly as a penal settlement, under the autocratic authority of the governors appointed by the British government, supported by his unit of soldiers. The soldiers are often given free land, and settle in Sydney as colonists. Freed convicts are also given land and, soon, free inhabitants outnumber convicts. Satellite penal colonies have been established in Tasmania (which later becomes a separate colony, 1825), Brisbane & Norfolk Island, and colony of free settlers in Western Australia. After the initial settlement, the British colony was confined to the vicinity of Sydney for 25 years until, in 1813, a way across the Blue Mountains was pioneered. Settlers immediately drive their flocks of sheep & cattle inland, becoming the first of a class of “squatters” that will come to dominate the interior for decades to come. 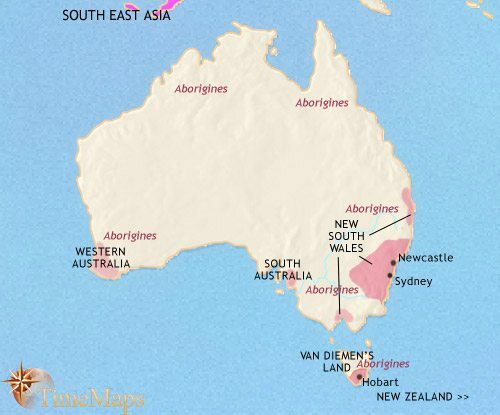 The coming of European settlers has had a huge impact upon aboriginal society. The spread of European diseases has led to drastic declines in population. On the other hand, contact with Europeans has expanded and intensified already existing trading and manufacturing networks. New metal implements allow new food sources to be exploited, such as seals and dugongs, and deeper-sea fishing using dugout canoes has been introduced from South East Asia. Throughout this period, exploration expeditions, many of them epic tales of endurance, have mapped the interior of the continent. These have been followed (where the environment makes this possible) by settlers. These have usually been squatters grabbing large parcels of land for their ever-increasing flocks of sheep. Although the transportation of convicts has been phased out between 1840 and 1868, hundreds of thousands of settlers continue to arrive in Australia, mostly from Britain. Gold rushes in the 1850’s tripled Australia’s population, and greatly expanded the economy. 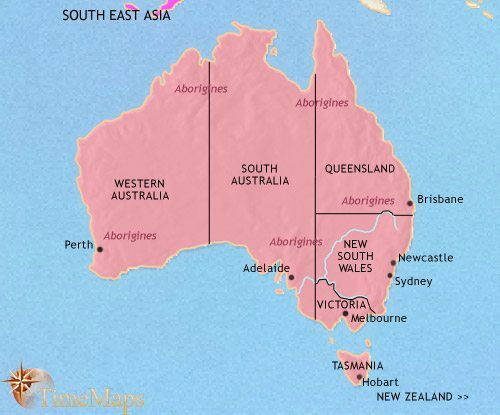 The expansion of white settlement has been marked by the creation of the colonies of South Australia in 1836, Victoria in 1851, Queensland in 1859 and the Northern Territories (initially, oddly, as a part of South Australia) in 1863. These colonies, like New South Wales, have become self-governing units under their own assemblies. This phase of Australian history has been marred by a policy of enforced Europeanizing of aborigines, including the taking of aboriginal children from their parents and the hunting down of recalcitrant groups. Along with the disease that the Europeans have brought with them and the land grabs of the white man, this has contributed to the demographic collapse of the aboriginal population by probably two thirds. Another Gold Rush in the 1890’s in Western Australia has boosted the population and wealth of the country. This is part and parcel of a great expansion of the Australian economy as, internally, a spreading railroad network knits the continent together, and steamships tie the Australian economy more closely to that of Britain. These developments lead to a huge growth in demand for Australia’s meat, wool and wheat. Australia has been granted national independence from Britain, 1901, within the British Empire. 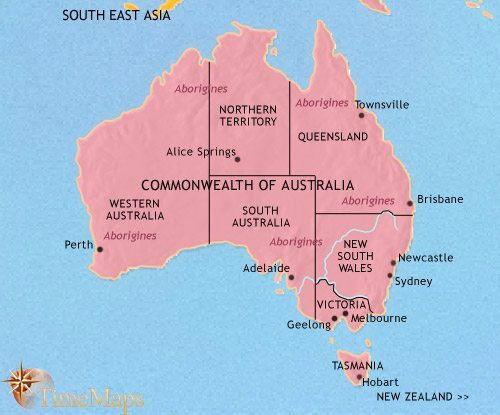 The six colonies have become six states within the Commonwealth of Australia. Each state has its own parliament, and a federal parliament conducts national affairs. The new city of Canberra has been designated the nation’s capital (1911). Australian armed forces played an invaluable part in World War 1, most famously as part of the ANZAC formation, which bore the brunt of the fearful fighting at Gallipoli. Under the terms of the Statute of Westminster in 1931, Britain’s dominions become sovereign states within the British Commonwealth of Nations, with equal status with Britain. They continued to share the British monarch as the head of state. Along with the rest of the world, Australia suffered from the Great Depression of the 1930’s. With the outbreak of World War 2, the nation again found itself standing shoulder to shoulder with Britain, and Australian troops were prominent in the North Africa campaign. When the Pacific region flared into war, Australia suddenly found herself on the front line. The Japanese even bombed Darwin. Australia became the base of the Allied war effort against Japan, and her soldiers, sailors and airmen helped dislodge the Japanese from their conquests. From this period dates the close alliance between Australia and the USA. The later part of the Twentieth Century sees Australia orienting itself more and more away from Britain, and towards the USA on the one hand, and the Far East on the other. Nevertheless, the Australian people have not, to date, voted to replace the British monarch with a republic. The population of Australia has become less and less Anglo-Saxon in composition, with large Greek and Italian communities coming in from Europe, and with an increasing number of immigrants coming from South East Asia. These different communities have greatly enriched Australia’s cultural life. In recent years, Australia has responded to an increasingly competitive world by a series of wide-ranging economic reforms, freeing up its business sector to operate more effectively. This has reaped significant dividends and Australia has been enjoying a period of high growth.